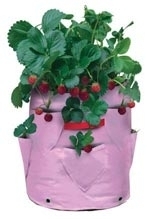 home » garden ideas » Container Gardening » Edible plants | Strawberry Plants in a pocket! Edible plants are a great way to the gummy bears out of your kid&#x27;s paws and sweeten your kids life with yummy strawberry plants. Get those kids digging their hands in the dirt and have them plant their own edible garden with strawberry plants in individual containers with pockets. Not only will they be happy with the treat from Nature, but your porch will look pretty too! Double win!! Strawberry plants are a great addition to any kitchen garden. These edible plants give the kids something to look forward to when their tooth is feeling sweet! These little pots will liven up your porch and your tastebuds with fresh strawberries grown with love by you and little helper. A planter with side pockets! Place a few small strawberry plants into the pockets of these containers, as well as the top, and you’ll find yourself with a pot with tons o' berries. Plant those Pockets: Put your potting soil all the way up to first pocket; then carefully place a strawberry plant in the pocket. Remove the plant from its pot, and poke it into the pockets. Keep going until you have done this with each pocket. Fill it up! 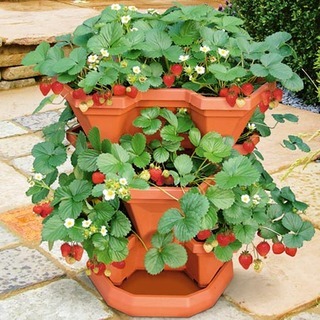 Fill the container with more potting soil, then plant the rest of those strawberry plants on the top. Get our your watering can and give it a good dousing. Strawberry plants: Just wait until you taste the goods from these cute plants! As they grow, they will form teeny tiny white flowers, which will then turn into the strawberry. They wil continue to produce tiny, sweet-flavored strawberries that you can pop right into your mouth—fresh from the garden, or better yet- why not bake a cake and top it off with your new berries. Show off your stuff with a double dose of sweetness. Having strawberries in your garden is a really awesome way to show your kids the importance of gardening. Besides they can have an organic treat every once in a while which is also cool. I&#x27;m definitely thinking about giving Strawberries a try in my indoor garden. They can be kept wonderfully compact where space is a factor. Thanks for the post, FigTree. Thats it! I will stop procrastinating and the kids and I will plant our stawberries this weekend! YAY! good plan- I planted them with my 6yr old son and he is in the garden every day checking out "his" strawberries. He says he now never has to worry about us starving to death b/c we can just eat strawberries :) I had no idea he was worried about this! Oh my Gosh- you guys are really making me want to start planting fruits and veggies this year. Not sure I&#x27;m up for it! Thanks for this post though- I think strawberries could be my very favorite berry! I know this is part of kid&#x27;s gardening camp, but it looks like the perfect project for a beginner like me- will try it this spring!